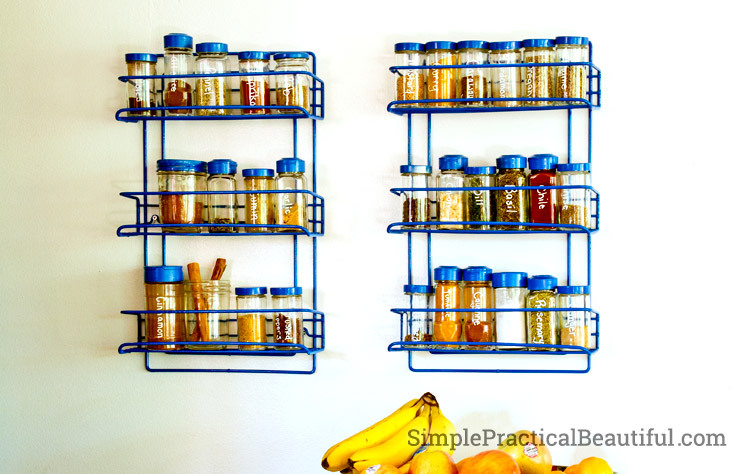 With a little paint, I updated my mix-matched, thrift store spice rack and added color and interest to a wall in my kitchen. I little while ago, I read on Up to Date Interiors, about DIY Copper and Chalk Seasoning Jars. 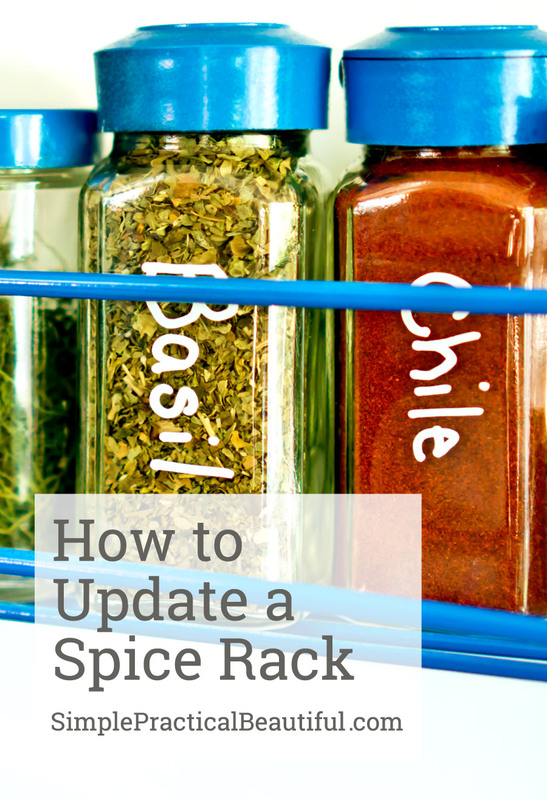 I loved how they look, and it inspired me to finally make my spice rack look better. 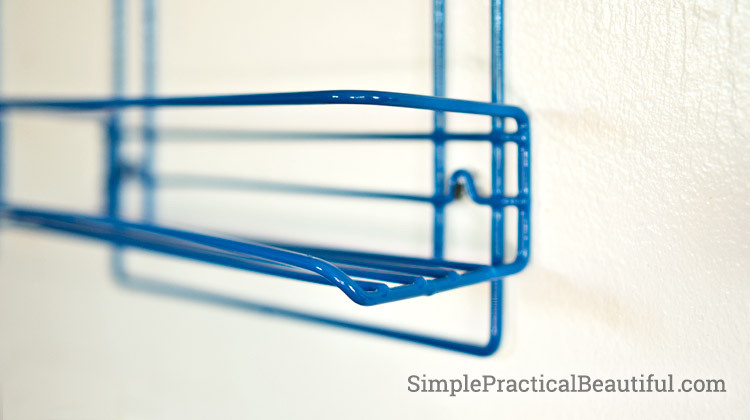 I loved her idea of using chalkboard paint, but I ended up just going with a glossy blue color because that matched better with the mid-century modern look of my home. 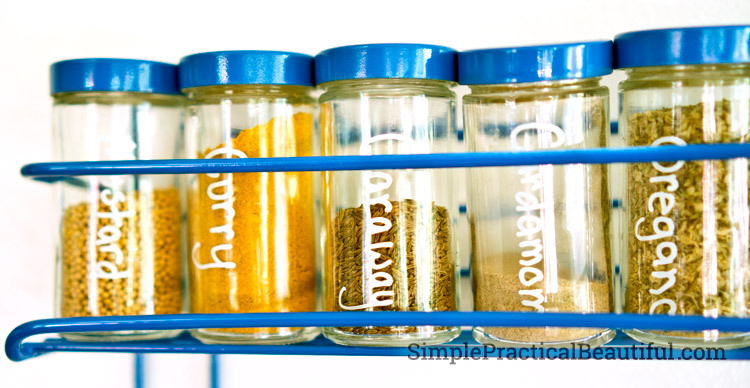 Years ago, I bought a spice carousel with matching jars. The carousel eventually broke, but I kept the jars because I love glass jars, and they were full of spices that I use all the time. I’ve also purchased several more spices in different glass jars, and I kept them all together in a couple of spice racks I found at Goodwill. I was starting to get a very messy, eclectic collection on my kitchen wall. Time for an update. First, I carefully washed all of the jars with the spices still inside. This meant I couldn’t submerge them in water, but carefully wiped around the glass with a sponge. I had to remove a few labels with Goo Gone and some soap and water. All the jars are glass, so everything came off beautifully, and they all cleaned up nicely. 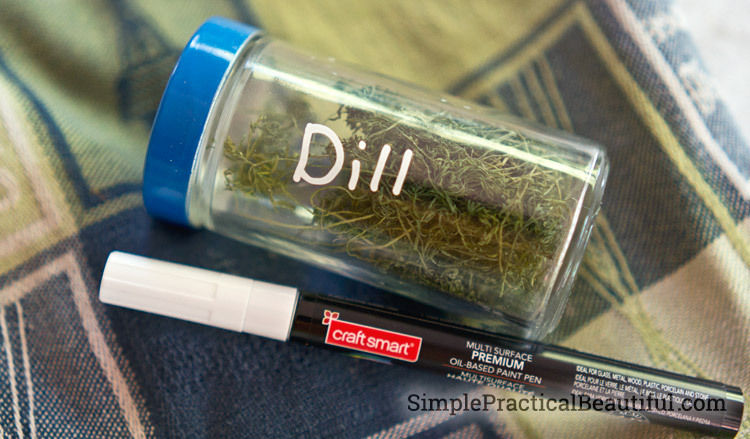 Using a white paint pen with a medium tip, I wrote the name of each spice on the jar itself. This way I can see which spice is which jar without searching through the lids. My writing isn’t great, but white paint on glass looked good anyway, especially with some of the darker spices inside. With all the jars labeled, I removed the lids and washed them well. 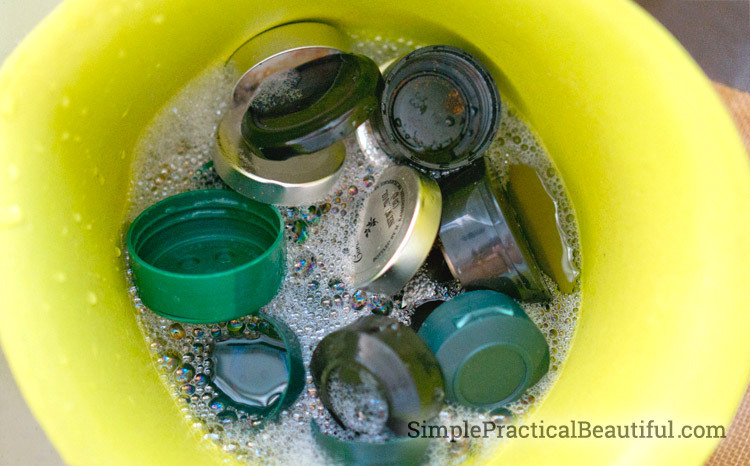 There was no way I could get the same lid back on it’s spice, so I washed any spice residue out with hot soapy water. I also had to use Goo Gone again to get a few sticky labels off the lids. I painted just the plastic lids with a primer specifically made for plastic so the paint would stick. I painted the lids and the spice rack with a blue Rust-Oleum Gloss Protective Enamel spray paint (the same paint I used on my chargers). It took a couple days for them to dry completely. In the meantime, all of my spice jars were sitting out on the counter without lids and making my kitchen smell really tasty and exotic. 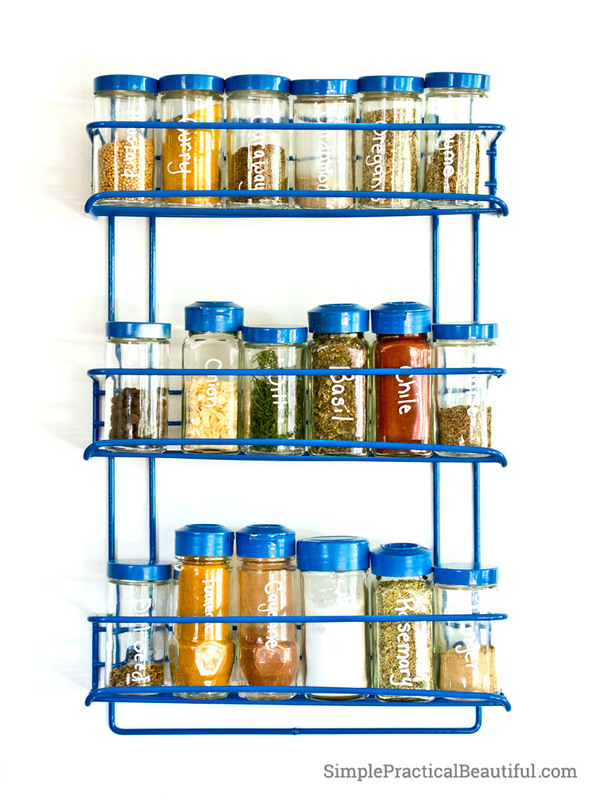 Here’s the finish spice rack, all clean and updated. Now I don’t have to hunt for the spices I need while I’m busy making dinner. This post was shared on some of my favorite link parties. Thanks for sharing my chalk and copper jars. I love how you made all of yours cohesive with that gorgeous blue paint. Super cute! Thank you! I loved your jars. I think copper is beautiful, I just haven’t figured out how to make it fit in my home yet. One day.